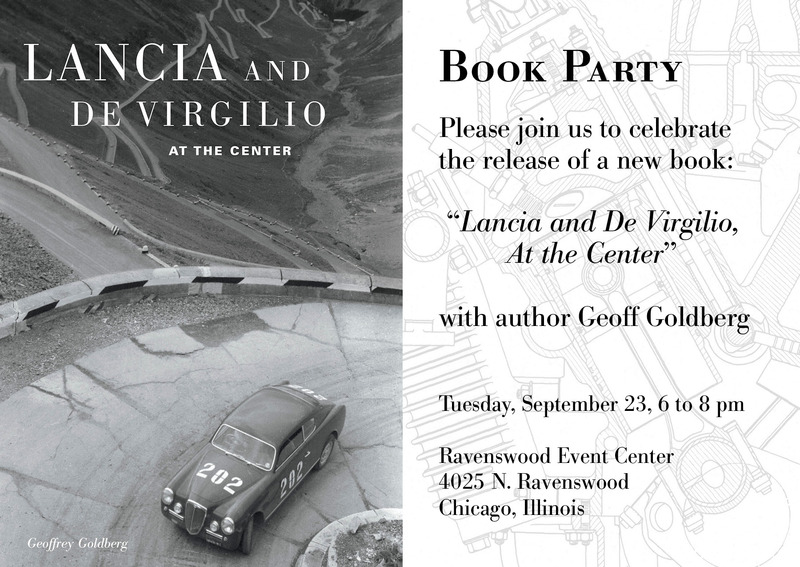 There will be a book party to celebrate release of Geoff’s new book, Lancia and De Virgilio, At the Center. It includes 1950s Italian auto engineering, corporate angst, and family drama. Its a car book that begins with a wedding…. The party is on September 23, at the Ravenswood Event Center in Chicago. Also on display will be the Hayes Collection of exotic sports cars along with some notable Lancia cars. At 7 PM, there will be a brief presentation. Event: Book Party from 6-8 PM, presentation at 7PM. There is a modest entry fee of $10 to pay for setup, wine and cheese. Tickets can be gotten in advance at: book release party, or cash at the door. « Hot Rod Appia – a V6?